The staff at the New York Times, together with the Italian Government Tourist Board, have compiled more than 40 lucid travel articles in this lavish paean to Italy. These selections, plucked from two decades of exceptional travel writing, express the country's unique diversity. Shirley Hazzard rhapsodizes about Posillipo, a historically rich headland of Naples where writers and artists have long sought ""pleasure and inspiration""; Alastair McEwen describes Milan, Italy's Big Apple, in all its ""industrial, entrepreneurial and international"" glory; and James Sturz tours a small portion of Alto Adige, an area in northern Italy that is studded with castles. The volume's postcard-perfect color photos, which number close to 500, nicely complement the text, capturing everything from the snow-covered peaks of Monte Cervino and the luscious, undulating hills of Tuscany to the frescoed buildings of Trento and the vineyards of Chianti. 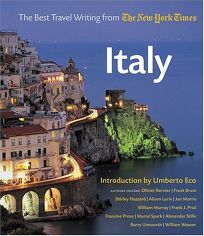 As Eco writes in his introduction, ""a journey to Italy... should always be seen as a journey of discovery that will reveal not one, but many Italies."" This hefty, handsome coffee-table book more than bears this out.